Myths and legends abound for many places along Ireland’s north coast. From the world-famous giant of the Causeway, to Ballycastle’s Children of Lir, these places have stirred the imaginations of visitors for centuries. 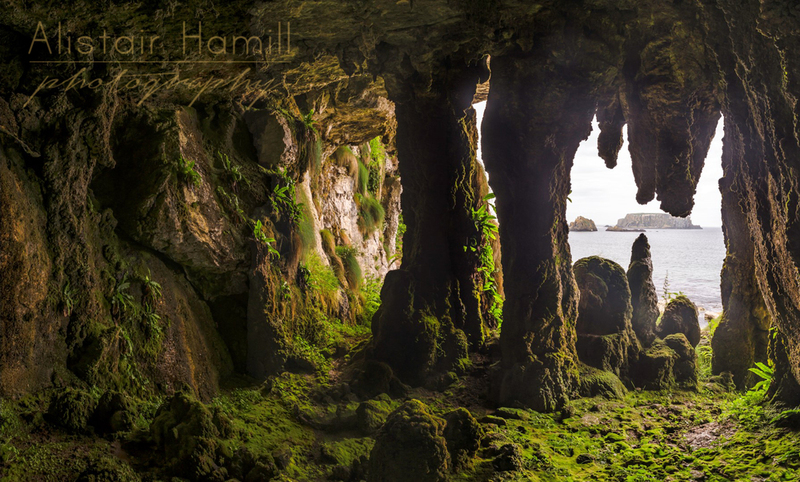 But if there is one place that surely deserves an epic fairy tale associated with it, it must be this enchanting little limestone cave in Larrybane Bay, Co Antrim. To step into it is to step into a different world, one where you would not bat an eye lid if a hobbit were to walk past. The Larrybane Bay area is a tourist honeypot, of course, with the ever popular and nerve-testing Carrick-a-Rede rope bridge dangling to the eastern end of the bay. Manys a traveller has no doubt paused across the rope bridge, looking into the azure waters of the Bay. Indeed, I myself have. But little did I (and probably most) know that this little gem of a cave was set into the very cliff face that I was surveying. I first got the heads up on this location courtesy of fellow landscape photographer Chris Ibbotson and I determined to pay it a visit. So, armed with a few directions from Chris, two of my daughters and I set off on an exciting adventure – to find the enchanted cave! But, aside from that (and having to be aware of the tides and waves), if you pick your footing carefully, after about 20 minutes of scrambling you should get your first glimpse of the cave. You’ll just see the top of the mouth of the cave, with some thick and stumpy stalactites dangling from the cave roof. Then it’s down behind another massive boulder before you round it to have your first view of the full glory of the cave. 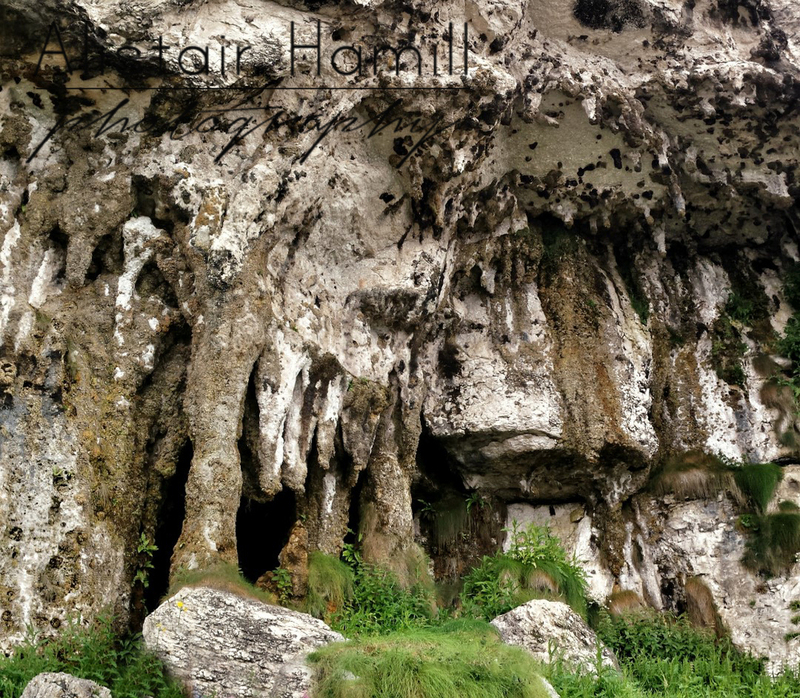 After a short climb up to the mouth, you will find yourself squelching through some very sticky mud in the cave entrance as you enter into the dark, dank and wet interior, keeping an eye out for hobbits or goblins. The cave itself is small, but it’s not the size that’s the most impressive feature. The interior is truly a magical place – the floor is covered in a thick carpet of vibrant green moss; there is the constant drip-drip sound of water droplets falling from the ceiling; and the roar of the Atlantic Ocean outside in dulled and muffled in this tranquil place. It has a mystical and tranquil quality that simply mesmerises and enchants. It is a place of serenity, a place where one could quite happily while away a peaceful hour or two, feeding your imagination with tales of mythical creatures and heroic adventures. But, aside for how it fires the imagination, the science facts of the cave are equally impressive. The cave is above the erosive influence of the sea (perhaps originally a relic from one of the north coast’s ancient raised beaches when sea levels were higher?) and the karst features that dominate it are simply stunning. Newer stumpy stalactites dangle from the ceiling while dumpy, rounded stalagmites grow up from the floor. But it’s the two main pillars at the cave mouth which are the most breath-taking. If you compare my photo with one taken around 1895 by local photographer and naturalist, Robert Welch, you’ll see that not much has changed in the last 120 years. Considering that the height of the cave is about 2.5m and that stalactites grow at a rate of around 0.13 mm/year, that means that these colossal beasts have been hanging around this cave for around perhaps up to 20,000 years!! It is truly a humbling experience to be standing looking at such ancient features. Stalactite Cave of Larrybane by Robert J. Welch c1890. The first photo of the cave. The views out from the cave mouth are stunning over. As you stand on the soft moss underfoot and peer past the pillars, it’s easy to imagine that you have been swallowed by a huge T-Rex and that you are standing on its huge tongue while looking out past its ragged teeth (well, it is if you have a couple of kids along to help fire the old imagination!) And from this gargantuan dinosaurian perspective, you can see our T-Rex is eyeing up his next meal - Sheep Island, of course! Whether it’s the geography of the karst features that appeal to you, or the way this little cave fires the imagination, it is surely a place worth visiting. Just one word – if you do, please be respectful of it. Such an untouched ancient location deserves to be treated carefully. Just as it has remained largely unchanged for the past 120 years since the first photo was taken, so it should remain in pristine condition for the centuries to come, when the people of the future, dressed in silvery future suits, will visit with their hover-boots and holographic cameras. Oh, there it is, firing my imagination yet again…!